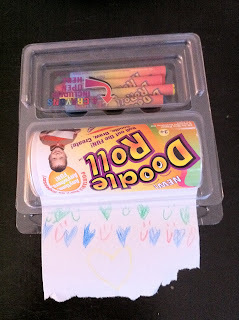 Doodle Roll is a simple but ingenious invention: a continous roll of drawing paper and crayons, packaged compactly to grab and go. It's available in two sizes, 3" x 15' (with four crayons) or 6" x 30' (with eight crayons). The plastic clamshell is easy for kids to access and features a slightly serrated, but not dangerously sharp, edge to cleanly tear off their masterpieces without the need for scissors. Roo just turned 7 and she loves drawing on the Doodle Roll and then rolling the paper back up. Jasper is a more rambunctious 3-1/2 and immediately unrolled his entire Doodle Roll, much as he enjoys doing to the toilet paper. Sigh. Thankfully it rolled right back up and snapped shut. A great affordable diversion for road trips and restaurants! 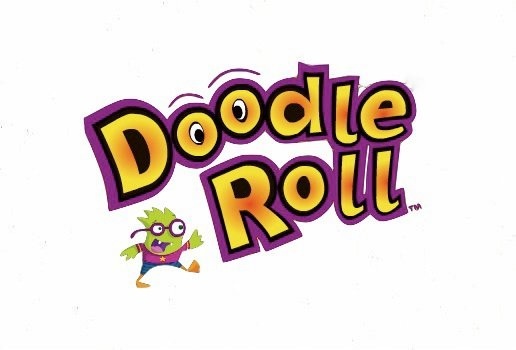 Follow Doodle Roll on Twitter and Facebook. In accordance to the FTC Guidelines and WOMMA Code of Ethics, I am disclosing that we received two Doodle Rolls to facilitate this review but all opinions are strictly my own.